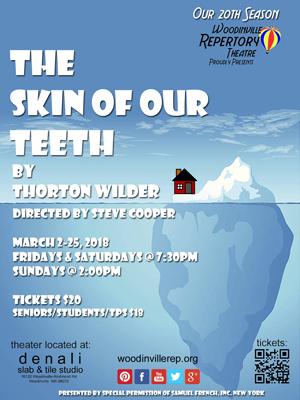 Thornton Wilder’s last great play was THE SKIN OF OUR TEETH, is still timely today. Wilder dramatizes in the struggle of humankind to survive in a uniquely funny, yet thought-provoking way. As in his other plays, Wilder focuses on the family unit to make his point—in this case, the Antrobus (anthropos meaning story of humans) family living in Excelsior, New Jersey. Although the settings are contemporary, each act is structured around a historic catastrophe: the Ice Age, the Flood, and modern war. Respectively, humans must pit themselves against nature, the moral order, and, finally, themselves. Join us for this wild and very funny ride!